Economic downturn? Don’t tell the thousands of travel agencies and companies who specialize in luxury travel. With over 400 exhibitors at the 2011 Luxury Travel Expo promoting their high-priced vacations and holidays, the sentiment of many of the 2,000 attendees is that luxury travel will actually increase in 2012. The Luxury Travel Expo is a gathering of exhibitors from around the world, including such varied locations as Taiwan, Bavaria, Croatia, Botswana, Macau and Dubai. Over 40 countries have sent representatives from their tourism bureaus to promote their destinations. Just about every type of travel is represented as well, with firms featuring luxury air, sea, rail and limo travel. The show runs from 6 December to 8 December and offers the attendees opportunities to network and learn about dozens of travel offerings in one, convenient setting. The show is located in the convention center of Mandalay Bay in Las Vegas, Nevada. 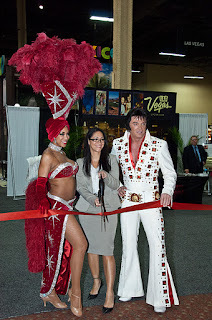 The Expo is presented by Travel Advisor and Travel Agent magazines, both members of the Questex Media group.